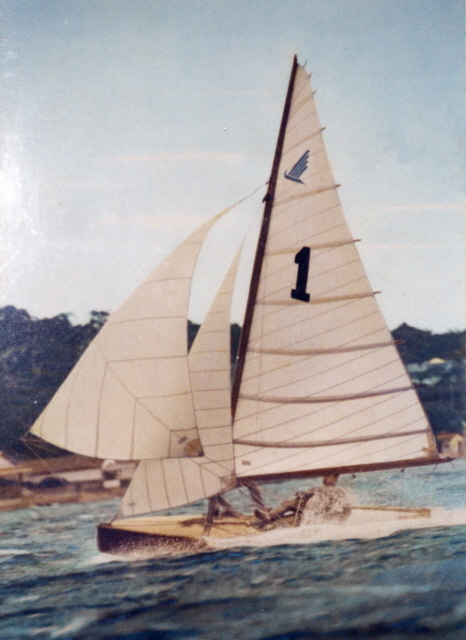 The Australian 14' Skate Sailing Dinghy is a two-man dinghy designed in 1956 and was the original performance development class, with the sail plan created by Jack Herrick and the hull by Vince Minter. The hull was redesigned and widened in 1971 by Doug Jeffkins and the measurement tolerances were tightened. The first fibreglass hulls appeared in 1971, with foam sandwich hulls being produced from 1979. The size of the mainsail and spinnaker were increased in 1983-84 season. During the 1990s the mast height was increased and the sail plan modified to improve the aspect ratio. The class further evolved in 2000 with the introduction of an asymmetrical spinnaker mounted from a bow pole. Skates are now configured with the taller rig and bow pole (either carbon fibre or aluminium, extendable or fixed depending on personal preference). Winged rudders were introduced in 2006 to increase speed and stability in rough conditions. These changes have made the Skate easier to sail and less sensitive to crew weight. "Congratulations on the Skate web page. It's just great to see the class alive and well and progressing as it has over the years. It sure looks like a frantic ride these days just as it was 50 years ago when we launched the first Skate. We have been checking the site for the last few years and the wife said I should contact you, so here I am. "My name is Richard Wilson and along with my three brothers, Gordon, Ken and John, we had the first Skate built by Vince Minter. Vince's idea was to design a boat that was easy to build, cost effective and would keep the older and bigger sailors of the day who were mainly sailing VJ's to stay on the water. And that was exactly the Skate did in those days. "We did try to get the VJ and VS associations to adopt the Skate as a class but they were not interested so the Skate association was formed in 1957 and 1958. The Skate was actually launched in 1956 and we had 14 races over that season with 14 wins against all comers from Lake Macquarie to Lake Illawarra. 1957/1958 saw three clubs sailing Skates with as you know the first title being won by Ray Young at Georges River Sailing Club, this boat was the original Skate. "From there the class boomed over the next couple of years and culminated in the Australian titles being held at Nedlands Club in WA. Between all the family, we have a lot of old memorabilia from the early Skate days if you are interested we could forward these on to you. "We have attached a photo of the first Skate taken in August 1956 at Port Hacking. Sure a lot different from the boats of today. Once again congratulations to all concerned in the Skate Associations Australia wide. It's great to see the class 50 years on still with a group of enthusiastic sailors promoting a terrific boat. "Would love to be present at the Australian titles for the 50th year, so we will see what we can do. East Fremante "Sizzle on a Skate" Promotion Day 2nd April 2011. Click here for a report from George Sloan. The 2010-11 Season marks 40 years of Skate sailing at East Fremantle Yacht Club in Perth. Click here to view an article by Allan "Spanner" Spencer. Concord-Ryde Sailing Club (CRSC) in Sydney once hosted a large and successful fleet of Skates. Click here to view a 2008 article on the history of Skates at CRSC from the club magazine. The club held its 50th anniversary Skate Reunion on Sunday 8 February 2009. Click here to view an article on the day by Kent McDowell. Click here to view some photos from the reunion. The 2006-07 Season marked the 50th anniversary of the Skate. NSW Reunion functions were held at Toronto and Georges River Sailing Clubs and the 50th Anniversary Australian Championship was hosted by Kangaroo Island Yacht Club, South Australia. The NSW Northern Region Reunion was held 4 November 2006 at Toronto Amateur Sailing Club and the NSW Southern Region Reunion was held 2 December 2006 at Georges River Sailing Club. Click here for details. Many Skate Legends and their families made the trip to Kangaroo Island for the Championship series and over 150 people attended the 50th Anniversary Reunion function on the second last night of the series. Click here for details. Article from April 1989 issue of Performance Sailing - interview with Skate Legend Alan Searl, thanks to Mark McEnearney. Click here for details. Article on Skate Legend Doug Jeffkins from the October 1971 issue of Seacraft - thanks to Russell Sullivan. Click here for details.